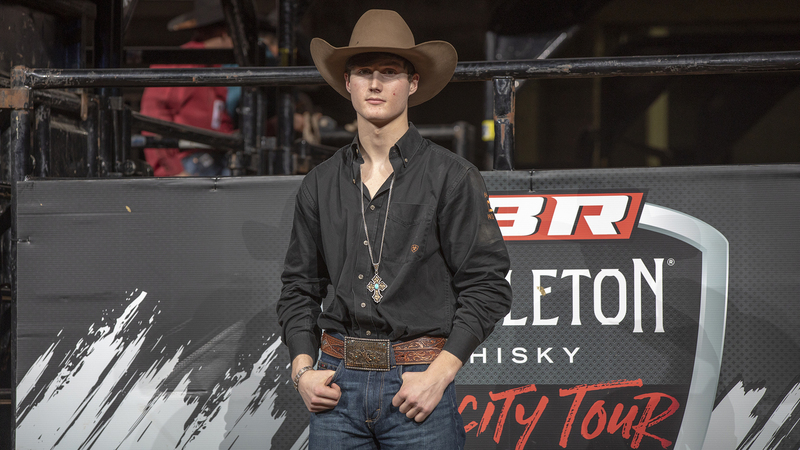 FRESNO, Calif. – PBR’s (Professional Bull Riders) Jake Lockwood (Volborg, Montana) won Round 1 of the Pendleton Whisky Velocity Tour’s Fresno Invitational at Save Mart Center on Friday night. As one of only six riders to cover a bull in the opening round of the weekend, the young gun from Montana had the northern California crowd on its feet with his 86.5-point ride aboard Angry Elf (Evan Matthews). For his efforts, Lockwood collected 50 world points. Mexico’s own Francisco Garcia Torres (Sal, Mexico) and 2018 World Finals event winner Marco Eguchi (Poa, São Paulo, Brazil) tied for second place with matching 85.5 ride scores. Earlier in the evening Torres made the 8 aboard Steak Sauce (Diamond Bar Cattle) while Eguchi, the last rider of the night, covered Bit A Bad News (Rocking Forty-Five Cattle). Each rider collected 17.5 world points. Finishing in fourth place was Torres’ countryman Juan Carlos Contreras (Huichapan, Hidalgo, Mexico). As the crowd cheered, Contreras rode Twisted X (Hawkins Bucking Bulls/Arthur Saabye) to record an 84.5-point ride score. Rounding out the Top 5 in Round 1 was Brazilian rider Paulo Ferreira Lima (Bezerros, Pernambuco, Brazil) who rocketed out of the chutes aboard Red Fury (Broken Arrow Bucking Bulls) for 83 points. Fans will be able to watch all the action from Fresno each night on RidePass.com or via the RidePass mobile app. Round 1 can be viewed beginning on Saturday, March 22 at 8 a.m.
1. Jake Lockwood, 86.5-0-0-86.50-50 Points. 2. Marco Antônio Eguchi, 85.5-0-0-85.50-17.5 Points. (tie). Francisco Garcia Torres, 85.5-0-0-85.50-17.5 Points.